Autopsy material was examined from British children dying early in the course of haemolytic uraemic syndrome (HUS). These presented after 1983, the period in which verocytotoxin-producing Escherichia coli (VTEC) infection was confirmed as the leading cause of diarrhoea-associated (D+HUS) in the United Kingdom. Of 18 cases referred for this study, 3 were found on review to have no history of a diarrhoeal prodrome (D-HUS). In the D+ patients, the median duration from onset of diarrhoea to death was 8 days (range 4–42 days). VTEC infection was confirmed in 6 cases. All had neutrophilia at presentation (median 21, range 15–49.8 × 109/l). The 15 cases had uniform pathological features, consisting of glomerular thromboses and congested rather than ischaemic glomeruli. Arteriolar thromboses were common at the hilum of glomeruli and were sometimes also seen proximally, including in interlobular arteries. There were cortical infarcts in 5 cases with extensive thrombosis. Cases were demonstrated to have significantly greater numbers of neutrophils expressed per 100 glomeruli than controls, when counted using immunohistological stains to neutrophil elastase and CD15. 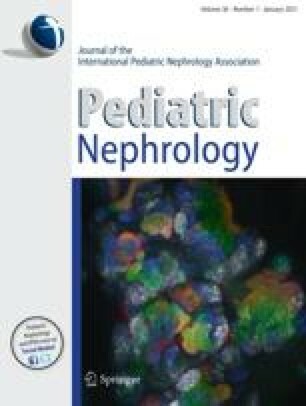 This study showed uniformity of the renal changes in D+ HUS and gave further evidence of the importance of neutrophils in the pathogenesis of the disease.